Please join us for an International Romani Day – Human Rights Event on Wednesday April 8, 2015, 7 PM at the Globe Cinema (Portage Place Shopping Centre, 393 Portage Ave, Winnipeg MB, R3B 3H6). This event will feature an Art Exhibition Roma Girls by Artbeat Studio alumnus Ildiko Nova, Romani folk music from Central and Eastern Europe by the Bart House Band and a Film Screening of the documentary Without a Chance (Hungary, 2014). Studio Central will be closed for Good Friday April 3rd – There will be no programming on that day. Artbeat Alumnus Jaime Hogabaum’s art is currently on display in the Alumni Gallery. Kathleen Crosby’s (Artbeat Alumnus) work is on display at the Millennium Library. You can find Kathleen’s paintings in the library on the second floor. On the tenth of each month Artbeat Studio publishes ten poems to Kaleidoscope Online (ten on the tenth) – to read this vast array of poetry go to – http://artbeatstudio.ca/kaleidoscope-online/. 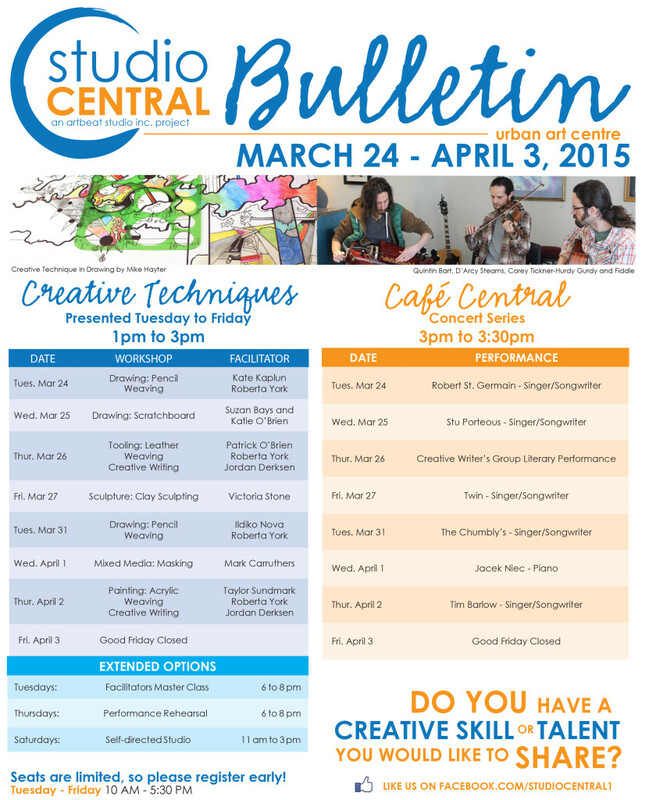 Join us at Studio Central – our day programs, Thursday Performance Rehearsal and Self Directed Studio are in full swing. Please call 204 -943-8290 to register. We look forward to seeing you!